The One about NaNoPrep Day! Last year I wrote a novel… maybe you’ve heard of it? Anyway, I promised a sequel next year. So it’s time to get serious. 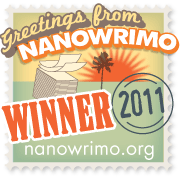 Last year’s novel came out of a project called “National Novel Writing Month.” NaNoWriMo for short. The goal is simple – write 50,000 words in the 30 days between 12:01 a.m. November 1st and 11:59 p.m. November 30th. Last year, I did a little better than that. I wrote 83,805 words in 26 days. Of course, I misunderstood the concept of the contest – I thought you were supposed to write a WHOLE novel – not just 50,000 words. So I pulled on Thanksgiving weekend a 32-hour marathon session at the Starbucks at South Florida and Beacon in Lakeland, FL. and finished the first draft. And the rest, as they say, is history. I even became a winner. Even got a cute little badge to show for it…and got a badge to show for it. But you don’t get to rest on your laurels. So I’m getting ready to write. 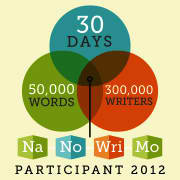 And the friendly folks at NaNoWriMo even planned a day to help me. First time ever, they scheduled October 17th, two weeks out, as NaNoPrepDay. They’ve even sent me a whole pile of ideas on how to spend the day. But me, I’m going to use it to take the eight notebooks I’ve jotted ideas in over the past year and consolidate them down to one single place – that way, I have the whole pile of ideas all distilled down into the best possible beginning. So watch this space for ramblings and rumblings as the next novel takes shape. This entry was posted in Fiction, Writing and tagged NaNoWriMo, writing. Bookmark the permalink.